Shelby American unveiled its 2013 Shelby GT500 Super Snake with a new performance option that will keep the snake firmly planted on the ground. When buyers take their 2013 Shelby GT500 to Shelby American in Las Vegas, Nevada, they can get a performance engine upgrade from 662 horsepower all the way up to a mind-numbing 850 hp. The 2013 Shelby GT500 Super Snake is the ultimate in high-performance from Shelby American, who is the performance division from Shelby. Now those lucky owners of the Super Snake can get another performance upgrade from Shelby American that will keep all four wheels firmly planted on the ground. Shelby American unveiled the new 2013 Shelby GT500 Super Snake at the North American International Auto Show in Detroit this week, with a new “Wide Body” option. The new performance option adds approximately six inches of road hugging rubber to the rear and three inches to the front. The new kit features massive 345/35/20 rear tires and wheels that give the Super Snake even better traction than before. Adding wider tires to a car has been something done since the beginning of the hot rod. But Shelby takes it to another level by adding the tires and wheels along with the new “Wide Body” kit to wrap around the massive new tires. The full package will cost buyers $17,995 and will use light weight fiberglass components and the craftsmanship that will merit the Shelby brand. The full kit will feature rear quarter panels that will add an additional six inches to cover the 20 x 13 inch wheels and tires. The front kit features new front quarter panels that add an additional three-inches for the 20 x 10 inch wheels and 265/35/R20 tires. The new wide body kit will certainly add a unique styling to the already good-looking Super Snake. But the new wide body kit is more than just cosmetic. Shelby American is offering buyers exterior stripes for the new wide body option that will include Satin Black, Gloss White, Silver, Blue and Red stripes. Buyers can also choose wheel options that include a rear-only or front-only “wide body” packages. Shelby hasn't release pricing details on the front-and rear-only packages. 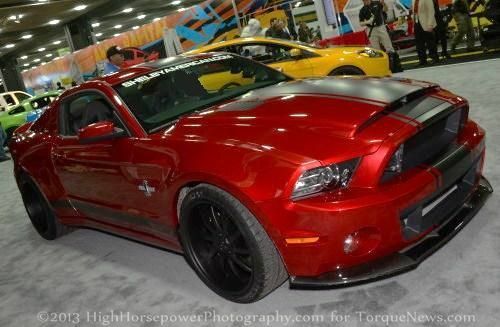 The Wide Body package is also available from Shelby American for 2005 to current Shelby’s and Mustangs.